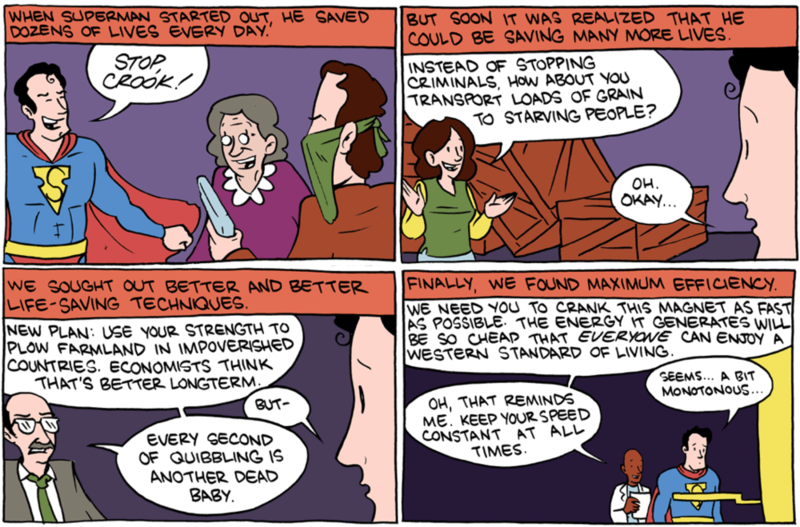 Why Superman was wrong to fight crime – comic from SMBC. Many people think of Superman as a hero. But he may be the greatest example of underutilised talent in all of fiction. It was a blunder to spend his life fighting crime one case at a time; if he’d thought a little more creatively, he could have done far more good. How about delivering vaccines to everyone in the world at superspeed? That would have eradicated most infectious disease, saving hundreds of millions of lives. Here we’ll argue that a lot of people who want to “make a difference” with their career fall into the same trap as Superman. College graduates imagine becoming doctors or teachers – careers that help people directly. But these may not be the best fit for their particular skills. And like Superman fighting crime, these paths can often only help a limited number of people at once. In contrast, Nobel Prize winner Karl Landsteiner discovered blood groups, enabling hundreds of millions of life-saving operations. He would have never been able to carry out that many surgeries himself. At the same time, many graduates feel unfulfilled in their careers because they don’t have a job that directly helps people. But there’s no need for this. It can be fulfilling to help indirectly as well, so by being more open-minded and creative about how to do good, more people can find a career that both uses their unique skills and helps others. Below we’ll introduce four ways to use your career to help tackle the social problems you want to help work on (which we identified in the previous article). The four ways are earning to give, advocacy, and research, as well as direct work. We’ll make concrete recommendations on how to pursue each approach. 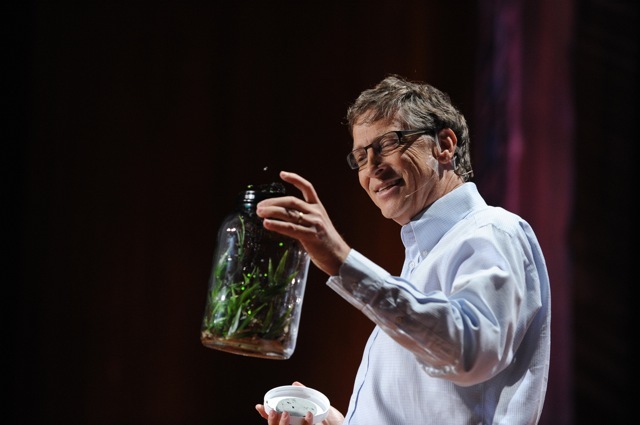 Would Bill Gates have done more good if he’d worked at a small non-profit? We don’t normally think of software engineering as a path to doing good, but Gates has saved the lives of millions of children by funding vaccines. That’s a huge amount of good, even if you’re not keen on Microsoft. Bill Gates has had a huge humanitarian impact through philanthropy, saving the lives of more children than the population of Scotland, which we think more than makes up for the blue screen of death. We often meet people who are interested in a higher earning job, like software engineering, but are worried they won’t make a difference. Part of the reason is that we don’t usually think of earning more money as a path for people who want to do good. However, there are many effective organisations that have no problem finding enthusiastic staff, but don’t have the funds to hire. People who are a good fit for a higher earning option can donate to these organisations, and make a large contribution indirectly. Earning to give is not just for people who want to work in high paying industries. Anyone who aims to earn more in order to give more is on this path. Consider the story of Julia and Jeff, a couple from Boston with two children. Julia switched from non-profit admin work to social work at a prison. Jeff used to work as research technician. He decided to train up to become a software engineer, and eventually got a job at Google. The couple were able to earn more than twice as much, so started to donate about half their income to charity each year. One alternative to earning to give is advocacy – the promotion of solutions to pressing problems. Advocacy can also be pursued in a wide range of careers, and can be even higher impact than earning to give. In the twentieth century, smallpox killed around 400 million people, far more than died in all wars and political famines. Credit for the elimination often goes to D.A. 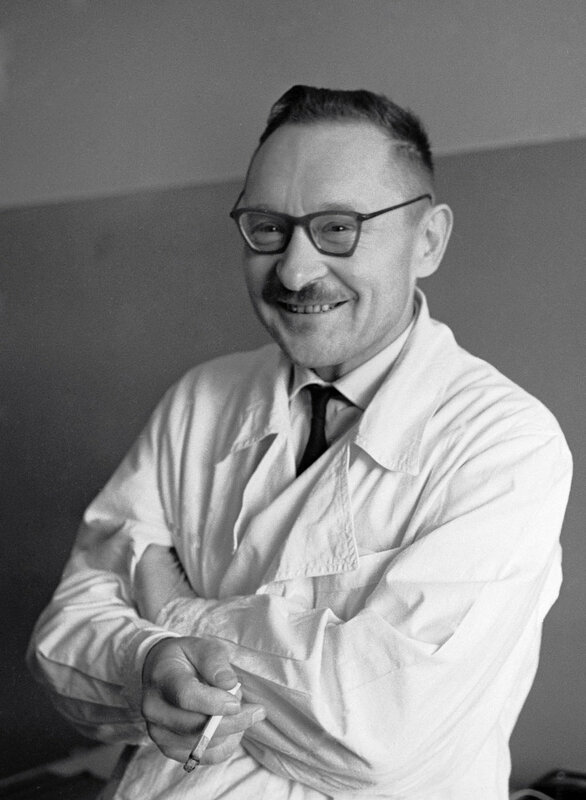 Henderson, who was in charge of the World Health Organization’s elimination programme. However, the programme already existed before he was brought on board. In fact, he initially turned down the job. The programme would probably have eventually succeeded even if Henderson hadn’t accepted the position. People often pan academics as Ivory Tower intellectuals whose writing has no impact. And we agree there are many problems with academia that mean researchers achieve less than they could. However, we still think research is often high impact, both within academia and outside. Along with advocates, many of the highest impact people in history have been researchers. Consider Alan Turing. He was a mathematician who developed code breaking machines that allowed the Allies to be far more effective against Nazi U-boats in WW2. Some historians estimate this enabled D-day to happen a year earlier than it would have otherwise.3 Since WW2 resulted in 10 million deaths per year, Turing may have saved about 10 million lives. And he invented the computer. Turing was instrumental in developing the computer. Sadly he was prosecuted for being a homosexual, perhaps contributing to his suicide in 1954. Turing’s example shows that research can both be theoretical and high impact. Much of his work concerned the abstract mathematics of computing, which wasn’t initially practically relevant, but became important over time. On the applied side, we saw lots of examples of high impact medical research earlier in this guide. Of course, not everyone will be an Alan Turing, and not every discovery gets adopted. Nevertheless, we think research on average is effective, and frequently better than working directly on a problem. Why? First, when new ideas are discovered they can be spread incredibly cheaply, so it’s a way that a single career can change a field. Moreover, new ideas accumulate over time, so research contributes to a significant fraction of long-run progress. However, only a relatively small fraction of people are engaged in research. Only 0.1% of the population are academics, and the proportion was much smaller throughout history. If a small number of people account for a large fraction of progress, then on average each person’s efforts are significant. Second, this is exactly what we’d expect from economic theory. Most researchers don’t get rich, even if their discoveries are extremely valuable. Turing made no money from the discovery of the computer, whereas today it’s a multibillion dollar industry. This is because the benefits of research come a long time in the future, and can’t usually be protected by patents. This means there’s little commercial incentive to do research relative to its importance. So if you docare more about social impact than profit, then it’s a good opportunity. In fact, the more fundamental the research, the harder it is to commercialise, so, all else equal, we’d expect fundamental research to be more neglected than applied research, and therefore (all else equal) higher impact. On the other hand, applied issues can be more urgent – applied breakthroughs like the telescope can let us make fundamental breakthroughs faster – so it’s hard to say whether applied or fundamental research is more pressing on average. Like advocacy, research is especially promising when you’re a good fit, because the best researchers achieve much more than the median. Most papers only have 1 citation, whereas the top 0.1% of papers have over 1,000 citations. One good person can cover the ground of five, and I’m not exaggerating. If you might be a top 10% researcher in a pressing problem area, then it’s likely to be the highest impact path for you. 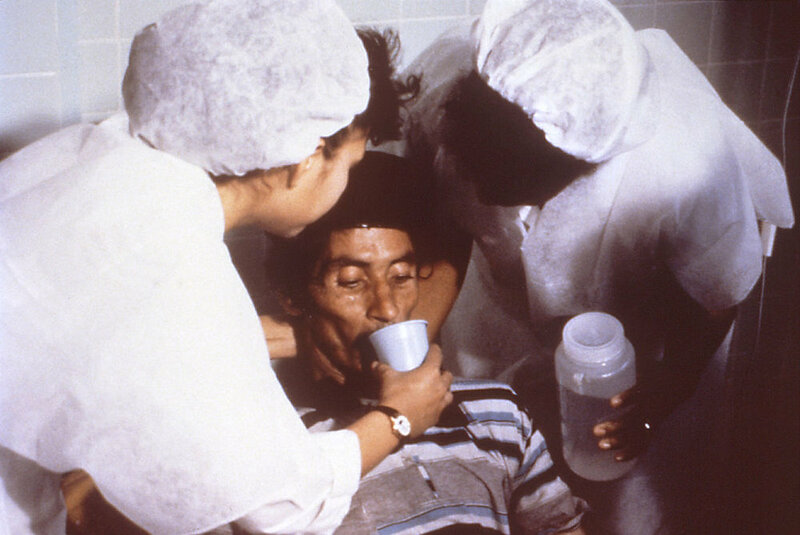 As we saw earlier, Dr. Nalin helped to save millions of lives with a simple innovation: giving patients with diarrhoea water mixed with salt and sugar. Becoming an academic administrator doesn’t sound like a high impact career, but that’s exactly why it is. Research requires administrators, managers, grant makers, and communicators to make progress. Many of these roles require very able people who understand the research, but because they’re not glamorous or highly paid, it can be hard to attract the right people. For this reason, if a role like this is a good fit for you, then it can be promising. What ultimately matters is not who does the research, but that it gets done. A hero of ours is Seán Ó hÉigeartaigh. He studied for a PhD in comparative genomics, but ultimately decided to pursue academic project management. He became a manager at the Future of Humanity Institute, which undertakes neglected research into emerging catastrophic risks, like engineered pandemics. He did a heroic amount of work behind the scenes to keep things running as funding rapidly grew. When there was an opportunity to start a new group in Cambridge, he used what he’d learned to lead efforts there too – at one point managing both groups. The field would have moved much more slowly without his management. If you’re interested in these positions, the best path is usually to pursue a PhD, pick a field, then apply to research groups. If you do want to help directly, how can you do that most effectively? The problem with many direct work positions is that they’re not neglected. For instance, in earlier in the guide we saw that clinical doctors in rich countries don’t usually have a large impact because there are already many doctors in these countries, so the most important and impactful procedures are going to get done anyway. We also saw that neglected areas are higher-impact due to diminishing returns. Another problem is that many want to work at organizations that are more constrained by funding than by the number of people enthusiastic to work there. This means if you don’t take the job, it would be easy to find someone else who’s almost as good. Think of a lawyer who volunteers at a soup kitchen. It may be motivating for them, but it’s hardly the most effective thing they could do. Donating one or two hours of salary could pay for several better trained people to do the work instead. Or they could do pro bono legal work, and contribute in a way that makes use of their valuable skills. Other direct work positions limit your potential influence. Think of Superman fighting criminals one by one, or Dr Landsteiner trying to work really hard to perform more surgeries rather than discovering blood groups. However, there are plenty of other situations when working directly is the most effective thing to do. There are many great teams working on innovative, neglected solutions to pressing problems. If you’re a good fit for one of these, and they’re finding it hard to hire (they are “talent constrained”), then it can be the best option. Don’t end up like a top lawyer working in a soup kitchen – it would be far more effective to donate a few hours worth of salary. If an effective organization doesn’t exist within the area, then you could help found one. This was our thinking with NextStep. Here’s another area where this might be true. As of the last decade, several very large foundations have been created that want to fund charities that carry out evidence-based health interventions, such as the Gates Foundation, CIFF, and the Open Philanthropy Project (which is partnered with GiveWell). However, these foundations are short of projects that meet their criteria. If you could build expertise in getting health interventions efficiently implemented, you could raise tens of millions in funding from these foundations, and have far more impact than earning to give. This is what Joey and Kate are doing. They left college early to focus on fundraising for charities like Against Malaria Foundation. However, they realized it would be even higher impact to try to set up something new. They spent six months reviewing a list of health interventions, and found one that looked effective, was simple to roll out, but didn’t have a charity focusing on it. They settled on text reminders for vaccinations in India, which have been shown in four randomized controlled trials to make it significantly more likely for people to get vaccinated. They’re now setting up this organization and already have raised $200,000 from the Open Philanthropy Project. However, you don’t need to be the leader of an organization. As with research management, operations roles are both vital and difficult, but because these positions are unglamorous, it’s often hard to attract the right people. Finally, direct work can be for-profit as well as non-profit. For instance, Send Wave enables African migrant workers to transfer money to their families through a mobile app for fees of 3%, rather than 10% fees with Western Union. So for every $1 of revenue they make, they make some of the poorest people in the world several dollars richer. They’ve already had an impact equivalent to donating millions of dollars, and they’re growing quickly. The total size of the market is hundreds of billions of dollars, and several times larger than all aid spending. If they can slightly accelerate the roll out of cheaper ways to transfer money, it’ll have a big impact. Lincoln founded a for-profit company whose product benefits the world’s poorest people. If you’re providing a service directly to beneficiaries, a for-profit is likely to be more effective because you get better feedback on whether your service is useful, and you can scale up more quickly. Non-profits are best when they’re doing something that’s very hard to commercialize, such as research, advocacy, helping the extreme poor, and the provision of public goods like a clean environment, or services like education that take a long-time to pay off. However, sometimes it’s even possible to use for-profits to do socially important research and provide public goods. Elon Musk’s Tesla sells fancy electric cars to rich people, which isn’t very high impact. But the real mission of the company is to develop cheaper batteries that will make it much easier to transition to a green economy, and eventually electrify all of transport. Musk also created SpaceX, which makes money by selling cheap rockets to NASA, but the real mission of the company is to speed up the colonisation of space, and make humanity more likely to survive a disaster on Earth. How can you find a good direct work position? Decide which problems you think are most pressing. Identify the best organizations within these areas, especially those that are especially limited by talent rather than funding. Find the positions where you’d be the best fit. What about if you want to found an organisation? One mistake people make is trying to work out which organizations are needed from their armchair, or by choosing an issue that they’ve happened to come across in their own lives. Instead, go and learn about big, neglected social problems. Take a job in the area, do further study and speak to lots of people working on the problem, to find out what the world really needs. You need to get near the edge of an area before you’ll spot the ideas others haven’t, and have the connections you’ll need to execute. We’ve now seen that by thinking broadly – considering earning to give, advocacy, and research as well as direct work – you can find many more ways to make a big contribution to pressing problems. Hopefully that has given you some new ideas for jobs you could take. Now, how do you narrow these options down to find the best one? The first thing to note is that these four approaches are not exclusive, and you can do more than one at the same time. For instance, a teacher helps their students (direct impact), but could also develop new educational techniques (research) or tell their students about pressing problems (advocacy). We know a teacher who did private tutoring in order to donate more (earning to give). As we’ve seen, often your impact is more about how you use your position than the position itself. This means, you’ll want to look for the positions that offer the best balance of ways to contribute directly, through advocacy and through donations. The second point is that there is no single best approach for every problem. Rather, focus on the approaches that are most needed by the problems you want to solve. For instance, breast cancer doesn’t need more social advocacy to promote awareness, because almost everyone is aware that breast cancer is a problem. Instead, it probably needs more skilled researchers to develop better treatments. If you just focus on raising awareness, then your efforts won’t go as far. Just as we saw with choosing a problem, this means the most effective approach for you will be something you enjoy, that motivates you, and is a good fit for your skills. We sometimes come across people tempted to do a job they’d hate in order to have more impact. That’s likely a bad idea, since they’ll just burn out. Their example could also discourage others from doing good. An outstanding charity worker will likely do more good than a mediocre engineer earning to give, and the reverse is also true. On the other hand, people often underestimate how easily they can become interested in new jobs. We explain more about the importance of personal fit and how to work out which career is best for you in a later article. If you already have expertise in an area, then that should also be factored in. We have more specific advice broken down by area here, as well as in the career reviews and problem profiles. Conclusion: in which job can you help the most people? There are many more paths to helping others in your career than we normally talk about. Bill Gates started as a software engineer, and saved millions of lives through earning to give. Rosa Parks was a seamstress, and helped to trigger the civil rights movement in America through advocacy. Alan Turing was a mathematician, and helped to end WW2 through research, as well as inventing the computer. Elon Musk is a businessman, but is helping to revolutionize the car and space industries to reduce risks to humanity’s future. Most people aren’t Bill Gates, but even at a normal graduate salary, anyone can have an astonishing impact through earning to give, literally saving hundreds of lives. And it’s often possible to do even more through advocacy, research or direct work. Moreover, if you focus on the approaches that are best suited to the problems you want to solve and where you have the best personal fit, you can do even more good again. And you can do this while having a more satisfying career too. In this way, even if you don’t want to be a doctor or a teacher, it’s possible to do far more good with your career than is normally thought. Decide which two to five problems you think are most pressing. Find the relevant problem profiles, read the list of career ideas in each profile, and note any that could be a good fit for you. Go through the four approaches we covered in this chapter, and list out any other options that could be a good fit for you. The aim at this point is just to come up with more options. We’ll explain how to further narrow down in an upcoming article. If you are early in your career, browsing our careers may also help you generate some ideas. If you already have experience, read our advice by area. Is something you’re good at. Has the right supportive conditions (e.g. engaging work, fit with the rest of your life). Is focused on the most pressing problems – those that are big in scale, neglected and solvable – as we covered here. Uses most effective approaches, considering research, advocacy and earning to give as well as direct work. That’s what we covered in this article.  Is something where you have the chance to excel. We’ll explain how to work out where you have the best personal fit later on. Should you sacrifice to do more good? People often ask us whether they should sacrifice what they enjoy in order to have a greater impact. But, as you can see above, doing good involves less sacrifice than it first seems. A personally satisfying job involves helping others, because that’s fulfilling. And a high impact job will also be personally satisfying, because if you don’t like your job you won’t be good at it and you’ll burn out. So there’s a lot of overlap. We’ve also seen there are lots of ways to have a big impact with little, if any, sacrifice. So, rather than making sacrifices, the key thing to focus on is finding these highly effective ways to help. That’s not to say there’s no trade-off at all. It’s unlikely that the very best career for you personally is also the one that most benefits the world. Ultimately, you’ll have to make a value judgement about how to weigh helping others against your own interests. But fortunately, the trade-off is much less than it first seems. How can I put myself in the best position to get a high impact job? You probably can’t just walk into your dream job right away. Instead you’ll need to build your skills, connections and credentials – what we call career capital – and put yourself in a better position for the long-term. Especially early on in your career, it’s best to focus on both impact and career capital. In the next article, we’ll look at how to build career capital and best position yourself for long-term success. "Why Superman Shouldn't Have Fought Crime and What This Shows About Doing Good with Your Career." 80,000 Hours, 80000hours.org/career-guide/high-impact-jobs/.